Combine a pianist with a violinist playing music by English “Impressionist” composer John Ireland in concert with active participation by the audience using Sensemo and you get the world’s first experiment in live music, art and hi-tech. That’s the promise of Sight and Sound, which will be performed June 18 at 7:30 pm at the Community School of Music and Arts at Finn Center. Tickets are available online. The concert is very much a Menlo Park endeavor, spearheaded by resident Hazel Keelan (the violinist) and her neighbor Peter Ebert (the technologist) aided by his wife, Anya, along with Justin Schrum (the pianist) whom Hazel met at Veksler Academy. 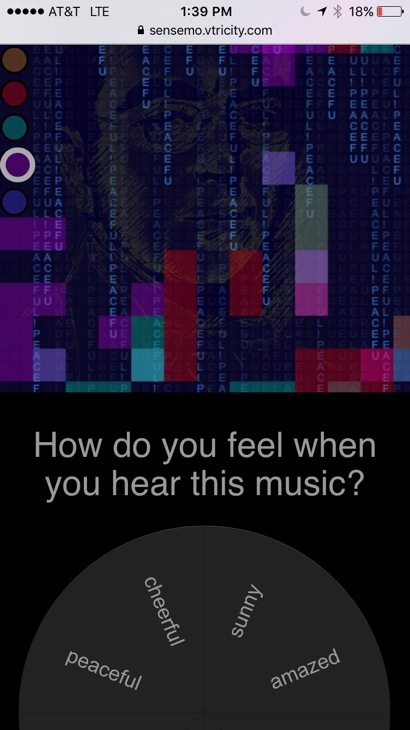 Peter, who is CEO of Menlo Park-based vtricity, refers to Sensemo (right) as “the world’s first instant emotion feedback cloud.” Concert goers who bring along their charged tablets and smart phones will be able to react in live time to how the music they are listening to is making them feel. The program will include John Ireland’s two piano compositions, Piano Sonata in E minor and Three Pastels as well as the Violin Sonata in D minor. There will also be live digital painting by local digital artist Caroline Mustard. All the participants hope that the concert is approachable even for people who never would have thought they’d enjoy classical music.